Although it’s not exactly news to people living in the shadow of gas drilling operations in North Texas, today there were several articles in the Ft. Worth Star Telegram and other local papers in drilling hotspots: Fracking means lots and lots of huge trucks driving all over the place, and in a few short years gas companies have caused $2 BILLION in damages to roads in Texas. And that’s not even counting all of our roads. The Texas Department of Transportation told industry representatives and elected officials Monday that repairing roads damaged by drilling activity to bring them up to standard would “conservatively” cost $1 billion for farm-to-market roads and another $1 billion for local roads. And that doesn’t include the costs of maintaining interstate and state highways. 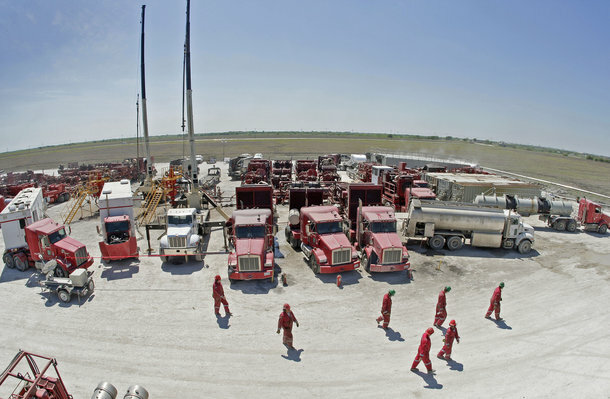 It takes an estimated 1,200 loaded trucks needed to bring one gas well into production, according to the Department of Transportation. That’s about the equivalent of 8 million cars driving on the roadways. So, something like 15,000 fracking wells have been drilled in North Texas, at the equivalent of 8 million cars each–that means in terms of damage done to asphalt, fracking has added the equivalent of a staggering 120 billion cars to the roadways. Unreal. This is indeed a huge industry, certainly not “just a few gas wells”.